10. The infomercial ran 300+ times per week on national and local TV – just in the USA – and much more worldwide. 9. 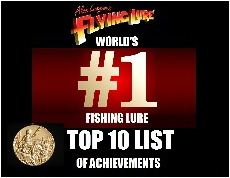 The Flying Lure spawned fishing magazine cover stories internationally. 8. The infomercial was named by Advertising Age magazine as “Winner, Best Commercial of Any Kind.” Supermodel Cindy Crawford’s iconic Pepsi ad was voted No. 2, something David Letterman made nightly jokes about. 7. Disney approaches Alex to write a book and publishes “Flying Lure Fishing” -- available today free, as an updated e-book. 5. Flying Lure demand depletes the worldwide production capacity for some types of hooks. 4. Sets the all-time daily sales record for any fishing lure: over $1 Million in 24 hours on the QVC shopping channel. 3. Flying Lure Sets the National All-Tackle International Game Fish Association’s Largemouth Bass Record in the Philippines during a bass tournament. 2. Wins top infomercial industry award - Program Length Advertisement of the Year (PLAY). 1. Becomes the all-time best-selling lure in the world.